Made To Measure Blinds. UK Online orders from Bay Blinds Limited. Note: Colours may appear differently on computer screens than in real-life. 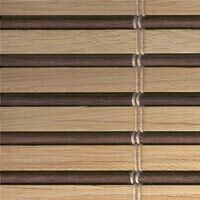 These lovely real wood blinds are manufactured in woven wood strips and dowels to give privacy together with dappled light. In four styles Jakarta, a natural whitewood, Tokyo, stained to look like dark mahogany with dark brown strings, Verona & Havana both in mixed natural & mahogany, both again in matching strings. Far more elegant than ‘roll up’ wood blinds, these are Roman style giving an appealing soft curved appearance as they are drawn up to the top and ends up with a pelmet made up of the blind itself. Our standard specification includes a matching wooden pelmet, co-ordinating cord and wooden toggles. A cord lock for the raise and lower operation is included and easy fit brackets for both top fix and face fixing. We offer these wonderful blinds in two formats, made to measure (cut to size from stock) or ‘Ready to Go’ in 7 widths and one drop (1600mm). We need 5-7 working days for the cut to size version but only 3-4 working days for the ‘readymade’ version. These beautiful, simple and stylish blinds will enhance any room giving you the option of dappled light and shade with the added benefits of real wood.